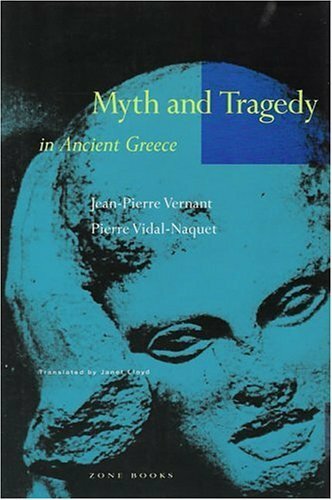 Jean-Pierre Vernant and Pierre Vidal-Naquet are leaders in a contemporary French classical scholarship that has produced a stunning reconfiguration of Greek thought and literature. Here they provide a disturbing and decidedly nonclassical reading of Greek myth and tragedy and the relationship between them. Jean-Pierre Vernant is Professor Emeritus of Comparative Study of Ancient Religions at the College de France in Paris. Pierre Vidal-Naquet is Director of Studies and Professor of Sociology at the Ecole Pratique des Hautes Etudes in Paris. does not collect evidence in order to make a case but rather cites the material in order to illustrate his ideas. "Vernant's career has been distinguished by his collaboration with other scholars, most notably with Marcel Detienne and Pierre Vidal-Naquet. His interest in applying anthropological study to ancient Greece derives from his teacher, Louis Gernet, a member of Emile Durkheim's (see Vol. 3) school of L'Annee Sociologique. Vernant also adapts ideas from structuralist anthropology, without, however, surrendering a historical perspective. He works most often on materials from Greece of the fifth century b.c. Classicists often resist Vernant's approach because it is so heavily informed by theory. Nevertheless, it provides a wonderfully rich and complex vision of the ancient world and is worth serious and prolonged consideration.